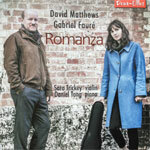 The coupling of David Matthews and Fauré is inspired: there are many echoes of the earlier composer in the later. Sara Trickey and Daniel Tong deliver the works of both in highly accomplished performances that combine passion with poise, to memorably poignant effect. [Commenting on Adonis] Matthews has a gift for drawing new beauties from traditional mediums and the ending of this graceful three-movement work, when he finally uncovers the Welsh folk song upon which the whole piece is based, is magical in its simplicity.